Sigh...umm so my Anya is slightly crocked. I didn't realize this until I matted her and quite frankly, I was too tired to care. At that point. At this point, I wish I had cut her out and straightened her up a bit. But she'll just have to do for today's post. This card was made for The Diedrich Dare challenge. My friend Jessica has the cutest kids ever and each week one of them comes up with a challenge and it gets posted to the blog. This week, Jack came up with a sketch. I tweaked it a little bit. The image is obviously from The Greeting Farm. 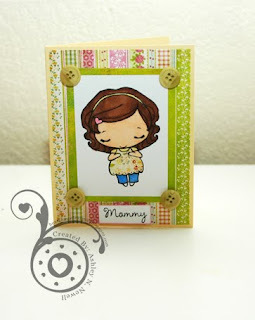 I'm borrowing some stamps from my friend Carole and kind of having a blast with all this TGF! The paper here is Basic Grey and the buttons are PTI. Have a great day everyone! I hope you are well! 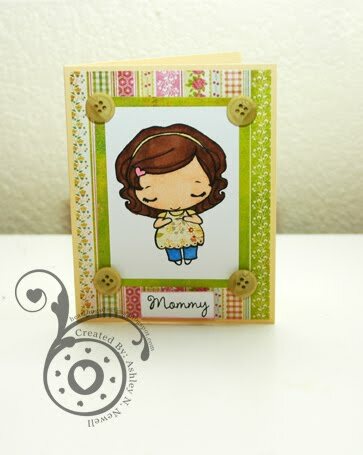 This is so cute and just love your coloring on this sweet Mommy Anya! Crooked or not.. it still looks fabulous. I love all the TGF images.. this one is super cute!! My sister just got a whole bunch of them and I so want to go over and ink some up for myself.. Love this Ashley!! This is PRECIOUS! What a fab job you did on Jacky's sketch-I can't wait til he gets home from school so I can show him. Love this! I love her. Great colouring. I didn't even notice she was crooked til you mentioned it! Thanks for playing Whimsical Wednesdays!